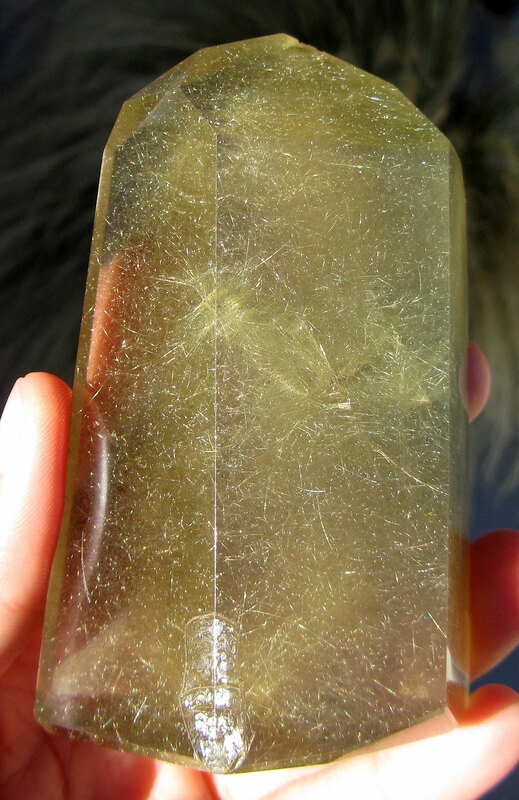 When Crystals Have “Accidents” – What Does it Mean? This blog article I shared back in 2012 is one of my most popular ones and continues to receive an influx of comments and messages, including personal stories and inquiries due to experiencing “accidents” or even loss of crystal friends. I’m so happy the share has been so supportive to many and I’m resharing it because of my own recent experiences again with this (https://taniamarieartist.wordpress.com/2016/10/28/joyous-shattering-into-multi-dimensional-limitlessness/ ) and hearing a lot of these experiences that are drawing people to the article, indicating a shared experience of shifts and crystal regridding work taking place collectvely. I also want to add that while I’m so pleased that many have found peaceful solace in this share (my original intention), it was meant as a simple share of my personal experience prompted by a client’s question that others may find comfort and connection with for their own. Although many ask my advice, I am not offering readings, intuitive sessions/coaching via this article, nor do I claim to have all the answers or to be psychic. Every case is individual and relative to your experience. While I, or anyone else may be able to intuit something, take time to reflect and review all aspects of your experience to retrieve a pattern, theme, or a possibility, I highly always encourage you to trust your own instincts, as within most all of the questions I receive, I also see the answers you are overlooking because of that lack of self-trust we all go through along our journey or perhaps not investing the valuable time to reflect upon and ask those questions to yourself and your crystal. If I’m able to support anything, I hope it is a support of that self-trust and cultivating learning to listen to the answers you have within you. I get tons of questions, not just from this article, but others and other aspects of my work, that I hope you can understand that I can’t possibly answer everything nor in any full length, besides the fact that a lot of questions imply what would normally be an official intuitive session by someone like myself or another who offers that kind of work. I love helping others, but I feel the best way to do that is to empower you. I’ve seen this post become a wonderful collective community for sharing experiences that are wide-spread, but also seems to have become a place people may feel is an offering of more than the scope of what the share was and how it was intended. Sending you all so much love to self-nurture you into your highest potentials and empowered embodiment of trust for the truth you have within. I receive questions often about the effects of “damage” to a crystal, as we all now and then can have what appear to be “accidents” or wake up to new discoveries with our crystal friends. Today, after receiving another loving inquiry, I felt it important to share a little on this and what I imparted to my client to support her with the answers she was seeking. I hope what I share will be helpful to others also seeking sense of peace with their dear crystalline companions who may have recently gone through a transition. The question I received was regarding a new crystal pendant that this sweet client purchased and “accidentally” dropped, leaving a small scratch in the crystal. She noticed the crystal seemed to be vibrating after and she felt sad and very bad that perhaps the fall had disorganized her energy. However you bring some lavender into your experience, your life will increase in enchantment, you will find another way of connecting to nature that will heighten your sense of honor, gratitude, and partnership with Earth, and you will experience a greater sense of centered peace and calm. If you’re experiencing stress and anxiety in life right now, try taking a lavender-infused bath, have a lavender massage, use an oil burner to fill your space with lavender breath, enjoy some deep breaths of lavender steam inhalation from essential oil placed in a bowl of hot water so you can breathe the vapor, soak your feet in lavender oil infused warm water, enjoy lavender body care and natural household products, tuck an aromatic sachet of it under your pillow, by your meditative altar, or in your dresser drawer, make a lavender compress, place some lavender in a beautiful vase on its own or added to a floral arrangement to enchant your space and remind you of nature’s miracle, or simply enjoy some lavender tea and infuse your foods with lavender essence. Lavender’s natural uses include relief of anxiety, nervous tension, and stress, as well as good for aches, pains, muscle and joint stiffness. If you’ve ever gone to get a massage you’ll note how lavender is most always used in your session. For anyone who also has hawk as a prominent animal spirit guide, I’m resharing this photo of the incredible hawk who came to perch on a tree next to the Magick Bus in the International Peace Garden so she may impart her medicine most penetratingly as you gaze in her eyes. I’ve shared in greater detail their symbolism before, but today is a short message of navigating and staying on path with deep presence and awareness, being open to and taking in wider perspectives, trusting your insights as they speak your truth, taking decisive actions with strength of vision and initiative behind them after surveying all creative possibilities, and knowing you have the ability to move through anything with grace and are being watched over by divine guardianship. You have the courage available to do anything. It’s both the time to bring forth your gifts and things you’ve procrastinated, but also a time to not act impulsively and await those air stream propulsions by assimilating everything to create alchemical alignment. There’s been a literal shattering of the old into the new and a powerful swoosh of cosmic energies streaming in that are shaking things up in transmutational ways for sure! It’s not arbitrary that I had just recently reshared about the prominence of my Golden Selenite Flower – on 10/10 to be exact – and then on 10/23 when things lit up for us it had a spontaneous explosion. This signifying the end of an era, but also reflecting the unlimited creative potentials we’d opened up to and are flowing in, not to mention a deeper merging of human and star self in a multi-dimensional and formless way. I mentioned in my post Cosmic Blossom & Cosmic Energies how this crystal had messaged me in wanting to be more intentionally active with my creative work and had come to sit alongside me on my desk daily to assist with that. That’s exactly what I’ve been harnessing and bringing forth more of in embodiment with all the new we’re creating. And the focus has been in cultivating very free-flowing, non-attachment, and full openness to exploring constantly evolving, creative potentials and their probabilities before choosing and jumping aboard the best alignment. So when this crystal, which had become a favorite, burst with exuberance, it felt to reflect this actualization and a message of stepping into a more empowered place fueled by passion merged with harmonious surrender….and of course letting go in order to be more of who I am. So rather than be sad, I celebrated this change I’d embraced. When Crystals Have “Accidents” ~ What Does It Mean? Life here on Earth is taking a different turn and different ways of approaching things are being called for. Everything is changing and rapidly. The peace will be found within your ability to embrace these rapid shifts. As mentioned in my post Portals of Peace, I found it auspiciously prophetic that I was holding this crystal during my last sound channeling called Black Moon Rising. And so peace pervades my experience all around, including the expansion of my crystal friend into her true multi-dimenionality….a reflection of my own greater experience of this and the cosmic support streaming in. It is no coincidence that the day it took place was the day we were guided to the new home space we will be living in for the next 6 months through the rest of fall and winter, seeing us into the spring of our own “blossoming”. It is no coincidence that it happened seamlessly on that day while we were driving by 5 different rental properties we were potentially interested in. We drive by to first feel it out if worth touring inside. It just so happens that the one we ended up with didn’t have an address we could find at the time in the listing, so we found the number and called. It just so happens the owner was there and when we asked for the address to drive by, he said to come on over and see it. It just so happens it was the rental I had loved the most from the photos and description and really wanted to see. It just so happens that when we walked in, it was everything we had hoped, and more. It just so happens we both loved it. It just so happens that it had only been on the market 11 days and we were the first to see it. It just so happens that he accepted our two cats and rabbits even though he advertised no pets. It just so happens it has things that will be nurturing of our time there and my finishing my book and projects, completely supported with inspiration. It just so happens that the place is all furnished, as we wanted it, and all white with beautiful sea life paintings for our watery selves and the sun pours in like an illuminated star high up at 7450 elevation (I love being as high up as possible), feeling like you’re in the heavens with a heavenly panoramic view of the lake and forest, and 2 minutes from Heavenly Mountain Ski Resort. It just so happens the place resembled in essence and appearance a dream I had and a room where I was receiving a cosmic upgrade. And after viewing it, we knew. And then we went on a hike where our first bald eagle sighting here at the lake took place, along with great blue heron showing up too and some symbols written in the dirt on the path that reiterated a profound confirmation. So while I could get hung up on being sad about this crystal shattering, I am instead joyous of her transformation that equates to my own and know that her infiniteness is now fully actualized and even greater unlimited possibilities will be streaming in for the rest of the journey ahead. Today felt like the perfect day to share these announcements with the rain coming down, which is what you hear in the video, cleansing all that has come before and making way for the new we are creating. Our Magick Bus journey has come to full circle closure, but the journey has just begun and is expanding into greater and unlimited possibilities, all anchored in the imagination of our hearts, as is aligned with the cosmic flow abound. We’ll be nesting in for the winter where I’ll be finishing my book in the inspiration of our “chateaux dans le ciel” (as its owners named it) – “castle in the sky” new home for the next 6 months while the rest of our visions unfold. I couldn’t imagine a more perfect place to create our next dreams. We’ll miss the Magick Bus and her nurturing guardianship, as well as her ability to provide opportunity to see with new eyes, and we wish for her to find the perfect soul/s whom she can help bring their dreams into manifestation too. Please excuse the breaks, as my recorder kept stopping and I tried to just pick right back up. Just like humans with blood flowing through our veins, trees have their own vascular system of flowing sugary liquid filled with water, nutrients, hormones, and minerals known as sap. Trees don’t typically leak sap unless damaged in some way for instance by a cut made in its trunk or due to bacterial infection for instance. And yet, this golden life source and healing tears are so beautiful when exposed vulnerably. Perhaps, once again, Nature shows us how exposing our own mysterious depths is rich with beauty and simply a way to know our wholeness and how we are divine harmony manifest. Hope is the pause, presence, and passion that assists you to align with opportunity in divine timing. This dove feather was one I found at the doorsteps of the Magick Bus upon arrival on the edge of a farm in Nebraska while making our way to Lake Tahoe, and when I looked up there was also a dove sitting atop a tree greeting us. While so many feathers have found their way to me over time and on this journey, receiving this new gift felt to herald a period of divine grace we’d be entering and supported with, along with a message of peaceful surrender that, if embodied, would see us through the next part of our ever-evolving “plan.” And that’s just what has taken place by our balancing intent with flow and action with surrender. The next morning after arrival, doves were ALL around, cooing beautifully in the stillness of the golden sunrise as we prepared to head out to Cheyenne. Their song holds the deepest kind of peace that resides in the depths of your heart and speaks to the soul of hope during life transitions, promise of renewal, and supports a return to harmony at the cellular level. I found it synchronous that I’d felt called to share a sound channeling where the doves were prolific, as if their song had taken a hold of my soul and inspired the music of my heart to come forth. I find it also auspiciously prophetic that I was holding my Golden Selenite Blossom during this channeling, which literally feels to have foreshadowed this new era, transmutation, expansion, and shattering of the old into the new, as you’ll learn in an upcoming blog. Our embrace of the energy flow has seamlessly guided us to our next step unfolding, of which we just heard word on today. And there is great peace and joy around this new phase that has come to us like a gift dropped from the wings of an angel, just as this feather was. Yet, it has come with embrace of the process, aligning with divine timing, and following instincts based on the energy we have felt. Dove gently coos her way into your life to share that it’s a time to embrace the integrity of your natural self and purity of your creative spirit to nurture imagination and follow your own true path, as you cultivate continued hope for the new. Clear vision, or that prophecy I spoke of receiving, are carried in message by dove, which can provide little glimpses into things to come, that assist you enough to know what things are “on path,” but not too much as to take away your creative power to continually imagine new ways while also aligning with the most supportive ways showing up for the highest good and in synergy with Mother Earth. Healing and gentle self-nurturing are possible on all levels when dove appears, and that comes with the surrender of all things past, future, and now that you hold onto with anxiety. Her presence promises a calm peace that is possible with this release. It may be that there will be a void time to journey through, of unknowns, as dove also symbolizes the “between times,” but also heralds how the physical and spiritual are more rapidly merging with the thinning of veils that arrive with your willingness to see more clearly. I don’t always know in the moment what something in totality means in the bigger picture, but the essence carries with me on a cellular level by way of my consciously taking the time to acknowledge what is showing up and keeping it in my back pocket, so to speak, percolating behind the scenes. Dove has been with me since the feather gift and so many doves surrounding the Magick Bus that day – more than I’ve experienced all at once of her presence. It has impressed upon me always having that “peace” of mind and heart no matter what presents itself….peace within chaos will see you through. And she also inspired the potential imaginative seed that my feathers I’ve found over time may one day be incorporated into some kind of shamanic, faery, cosmic portal activators later. For now, dove’s feather has already been an activator in assisting this new portal entrance. One of the reasons I felt we were guided back to Lake Tahoe was for Cosmo in bringing him to both the resting ground and life affirming place of his teachers and best friends, along with the hope of getting him the best care at this time in his life. Tahoe has also been a portal entry and exit point for the major things in OUR lives, which I’ll share more on shortly, but upon returning here other synchronous unfoldings have confirmed all of this and our reasons for needing to be here at this time, regardless of what else may unfold or not. It never ceases to amaze how we can align ourselves so easily by simply supporting and following the voice within. For instance my high-tech water filter that I purchased when living here 8 years ago broke down after arriving here and we just happen to be by its birth place in Reno for repairs if needed. Although, I’m considering a new and different filter since it is linked to an old cycle in my life. Just like letting go of my beloved “Hunab Ku” hybrid SUV last year right when we moved into our Magick Bus, which just had its one year anniversary of selling on the 16th of this month, coincidentally just after arriving back to Tahoe a little over a week ago and coincidentally I’m in the place I first got it. We also happened to be here to celebrate our anniversary and Dave’s birthday all within days of returning and on our first day up at the lake, I spread a bit of both Nestor’s and Joy’s ashes together on the water in celebration and so much more. And of course there’s huge full circle closure and opening in terms of nearly all aspects of our lives, which I mentioned, that all culminate here in this portal including where both Dave and I went through painful divorces, lost our most beloved soul animal companions (Nestor and Kitty Boom Boom), where all of our current or recently transitioned animal companions (except Cosmo) came into our lives (Joy, Gaia, Sweet Pea and Boojum), where Dave went vegan 8 1/2 years ago and me 10 1/2, where I became a Reiki Master Teacher and started my teaching as well as truly committing to and fully embracing my path in totality, where I went through the tipping-point vigorous round of personal growth work that would catapult me, where we both went through major soul and emotional shifts with extreme lows and life-transformations that have set our current courses, as well as where we met, along with other profound low and high points. So to say it’s a potent place for us is an understatement. But back to my original focus – Cosmo. Upon returning here, I did some research to find him the best care possible and as things do tend to align with trusting, I was guided to the perfect person for that, who was just a few minutes away from where we are stationed. This vet, who was previously focused as a small animal veterinarian in a busy general practice and has worked with wildlife like sea otters, elk, etc. along the west coast, now runs a small private practice focused on providing compassionate integrative and rehabilitative care that combines conventional medicine with natural approaches. She’s certified in veterinary acupuncture, veterinary food therapy, traditional Chinese Veterinary Medicine, and Canine Rehabilitation therapy. She’s a member of the American Holistic Veterinary Medical Association, American Association of Traditional Chinese Veterinary Medicine, and American Association of Rehabilitation Veterinarians. A gem of a find indeed. After speaking with several places and making nearly a dozen calls, I left her a message in hopes she may be able to help Cosmo, since other places weren’t wanting to take on a rabbit for acupuncture except for one in Reno that was an hour and a half away. And at this point, although I do take him for routine check-ups when necessary, I prefer him to get more holistic care that feels aligned with where he’s at in life and his soul needs. He’s always loved acupuncture and so that was my focus….I was just grateful to find even more! Anyway, the doctor called back and told me that she doesn’t take rabbits normally because she had bad allergies to them over the years, but when she heard my story over phone she said she wanted to try and help. Her willingness to do so was a huge plus in my book, as I’ve talked to other vets in the past who said the same and had no desire to try. I don’t like going to regular vet practices because it’s so stressful for Cosmo. There are so many dogs and cats going in and out, and the last time there was so much barking and a cat crying in the back, that it was just not conducive for a little sensitive one who is a prey animal to be going for peaceful healing care. But here at this place in Tahoe, it’s complete peace since it’s a private practice so it’s just the vet, me, and Cosmo. She took her time to learn about him and try a round of different things including acupuncture, non-invasive laser to help with inflammation, something called “Loop” that targets Pulsed Electromagnetic Field Therapy, and did a lot of therapy on his legs as well as Tui Na massage, which is a pinch and roll for the back along the spine. She also got out different herbs to try and see what he liked, which are good for his blood circulation and warming, along with other healing benefits. Cosmo immediately went for the magickal Angelica, which the doctor was so pleased about saying they always know what they need. She actually snapped a photo of him eating it while receiving acupuncture for her own records. In the office this was the only herb he went for, but since home he’s been enjoying the others she sent me home with too to try. He also liked the Body Sore pill, which is a Chinese herbal formula that helps synergistically to relieve symptoms of back pain, soft tissue injuries, musculoskeletal pain, and addresses underlying causes of these symptoms. Its an herbal blend to assist in invigorating Qi/Blood where there is stagnation, assist with channel blockage, and relieve pain. So she sent me home with some of these, along with a container of herbs, and a list of herbs/veggies good to assist with these things I can either continue using (in the case of my already giving him) or add to what I give him. She even helped assist with shaving some of his matted fur. As I’ve shared before, since he lays on one side all the time and can’t move away from his eliminations, I have to bathe, dry, trim, and groom him. So his fur goes in cycles every few months of being really great and then no matter what you do, getting really matted and eventually needing to shed/peel away. So she helped with that and gave me natural ideas to put on his skin like coconut oil. Our session ran over time by 25 minutes, but she was so patient in wanting to be thorough and help. And again, not to mention it was such a stress-free zone with no one there but us. So that was greatly supportive to the process. It was definitely like Cosmo was having a bunny spa day, which makes mom happy and him feeling extra nurtured and loved. The vet also learned that I am a Reiki Master Teacher and said that if I decide to teach up in Tahoe, she’d be very interested in learning so she can add that to her practice too. We’re figuring out a routine of sessions for him, which for now will be weekly, then something like biweekly or every three weeks or so for maintenance. I’ve missed his Orange County vet who was incredible with Cosmo and did acupuncture too for him, because he loved going there and receiving it, but I now feel we have a great doctor here who has even more wonderful things to offer him and minus going into a regular practice. It doesn’t feel like going to a doctor, but truly like receiving special care just like humans do when they go into physical therapy, acupuncture, massage, you name it. Plus, he’s up at Lake Tahoe – a portal itself to assist with his soul needs and things he is choosing. Also, the timing of his appointment last week aligned perfectly with his new orthopedic bed I got him, arriving right when I got back from his session. So he was able to stay in that healing, comfy zone from start to finish. This was also aligned with us being here, because although we could order things and have them shipped to us where ever we were, it had to be timed out just right to ensure arrival while we were some place. So being here, enabled me not only to get his new bed, but also a new Amethyst Biomat that I’ve been wanting for a long time, which was now able to be shipped and received to where we are. This provides “deep penetrating heat of Far Infrared Rays, Negative Ion therapy, and healing properties of Amethyst” to assist with joint pain, stiffness, muscle pain, arthritis, back pain, and has calming, healing benefits, providing peace and support for body, mind, and soul. The Biomat will also be woven into Cosmo’s at-home therapy, and of course mom and dad will be using it too. We have another appointment this week for him and so I’m happy to be able to provide routine, consistent care for a while and am so pleased to keep finding and creating more ways to support his special needs as an incredible soul in an aging rabbit body who is just a wonder to behold. I’m reminded of how his foster family didn’t want to invest the time and energy into his needs and had felt putting him to sleep was the best option. Hence, the urgency of the woman at the organization that placed him in his foster home, to find someone asap. No one wanted to take him on, or perhaps no one was meant to, but me. He and I are definitely connected because like Joy and Nestor, he was able to telepathically connect with me and send out a call for help, which I answered in an even more mysterious and profound way. And because of that and knowing I was meant to follow the promptings I felt, this amazing soul in rabbit body with spinal injury, major arthritis, enlarged heart, and inability to walk, had his life extended two years, so far, and still going at 10 1/2 years old. How did this all come about? Well, I would say magickally. I’ll share a little on why. I mentioned in earlier posts how rabbit energy has increasingly been showing up and due to several dreams, I knew that I wanted to do more for rabbits, as they are so dear to my heart. I do already have an amazing little one, Joy, who is a powerful healer and potent being all around. And I have had two other bunnies in my life, including the magickal Nestor. After the dreams I knew I wanted to be more active in helping rabbits, so I started volunteer work at a local rescue just a few minutes from my house. Rabbit energy continued to expand and envelope my life from there. Then one day, a week and a half ago, a friend tagged me in a post on Facebook from another rabbit rescue in Los Angeles, Bunny World Foundation. They had just come into receiving two infant rabbits that were in need of care, with a traumatic story as to how they were now there on their own without mother and two siblings that are no longer on this physical plane. My friend, like most people, knows that I’m a bunny person, or crazy rabbit lady😉 I constantly see posts like these and normally I will focus my action in sending healing energy, but for some reason I felt compelled to contact the organization and offer even more direct help. I felt drawn to care for them to help them get strong and healthy so they could then be adopted. I sat there and wrote my email, but hesitated hitting send. On some level I felt something more from this action I was taking and it was like a soul pause taking a moment to check in on making the definitive decision of responsible commitment on a level I was unaware of consciously, as I’m an all or nothing person. I don’t know the meaning of half a–sing things. So after a minute or two I finally hit send. It took a couple of days, but I then received an email from the head of Bunny World Foundation, and the rest unfolded from there. They had found a woman that specialized in infant care, as the infants needed special tube feeding you have to be trained for, but Lejla (the head of Bunny World Foundation) and I ended up having a long conversation connecting about so many mutual things, including knowing the woman who runs Save A Bunny, where I adopted Joy from. We concluded the call by my saying I’d love to help out in any way I can and asked if there was anything special she needed help with. And then she told me about Blizzy (named this because he reminded his rescuer person who was caring for him when he came to the Human Society of an Oreo Blizzard). (Of course we know Blizzy soon became Cosmo, more appropriately soul named when he came home with me). Blizzy was in need of a new foster home, as his current foster family was no longer able to care for him. They’d been looking for the last few months for someone and it was crucial he find a home that week. And of course, here I come along at the right time….I now know that he had called out to me, just as Joy, Nestor, and Gaia had, and I heard his call. I will say that, like with all things in my life, there is no randomness about it. I sensed this was something big for me…a mission in fact. And that was reiterated the day I picked him up. On my way out a hawk (one of my major animal totems at this time in my life) was sitting on the light post giving me the support, and on the way home, another. But while driving, a dear friend called that knew I was on my way to get him and she was sending me love and support. I said out loud to her, there was just something about this that I knew was so much bigger and I used the word “mission” to describe it. I got chills and knew in my heart everything was in divine grace. This “mission,” I refer to as, is many-fold and has come to bright light, is being fully acknowledged, embraced, and actualized in embodiment for me, and anchored in while hiking here upon return to Lake Tahoe. This all manifesting as what I’m focused on and investing my energy into now and future to come. But THAT is a story unfolding in its own divine timing.